Space.com wants your photos and descriptions of the supermoon lunar eclipse Sunday night (Sept. 27). The Virtual Telescope Project captured this view of the total lunar eclipse of April 4, 2015 at about 4:50 am PT. If bad weather spoils your eclipse night on Sunday, you can watch the event live online. The Slooh Community Observatory will host a webcast at 8 p.m. EDT (midnight GMT) and feature expert commentary on the event. 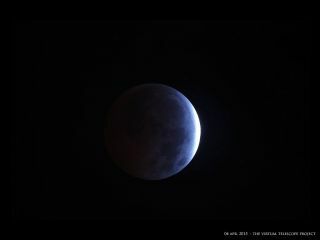 You can also watch the lunar eclipse webcast on Space.com, courtesy of Slooh. The brightness of the moon varies widely from one eclipse to another. One reason is that the moon sometimes passes through the darkest part of the Earth's shadow and, at other times, through the lighter outer umbra. But there is evidence of actual differences in the shadow from year to year. Thus, a careful description of the colors seen on the totally eclipsed moon and their changes is valuable. L = 3: Brick-red eclipse, usually with a bright or yellow rim to the shadow. L = 4: Very bright copper-red or orange eclipse, with a bluish, very bright shadow rim. To judge the Danjon number, you can use your naked eye, binoculars or a small telescope at low power. A fractional estimate, such as 1.8 or 2.5, may seem the most appropriate. Try to make three measurements: Examine the moon at mid-totality and also near the beginning and end of totality to get an impression of both the inner and outer umbrae. Grade 2: When the naked eye sees "spots" on the eclipsed moon, or the seas and other detail can be seen with hand instruments like opera glasses, field glasses and spyglasses. Grade 1: When instruments with apertures between 2 inches and 6 inches (5 to 15 centimeters) are necessary to show detail on the eclipsed surface. Grade 0: When apertures of 6 inches (15 cm) or more are needed. Another procedure is to estimate the stellar magnitude of the moon during totality by comparing its brightness to the other bodies in the sky. When it's faintest, at mid-totality, the moon may be similar in brightness to naked-eye planets or prominent stars. To see the moon and stars as comparable disks, some nearsighted observers need only remove their glasses. Another technique is to view both the eclipsed moon and comparison stars simultaneously through binoculars held backward, so that the large objective lenses are nearest to the eyes. Unless airborne volcanic aerosols or other unusual atmospheric effects influence its appearance, the moon's disk should appear moderately bright, especially right around the beginning and end of totality. The lower part of the moon will likely appear brightest and glowing aruddy or coppery hue, while the upper half of the moon should look more gray or chocolate in color.